Hazelnut allergy is one of the most common tree nut allergies. 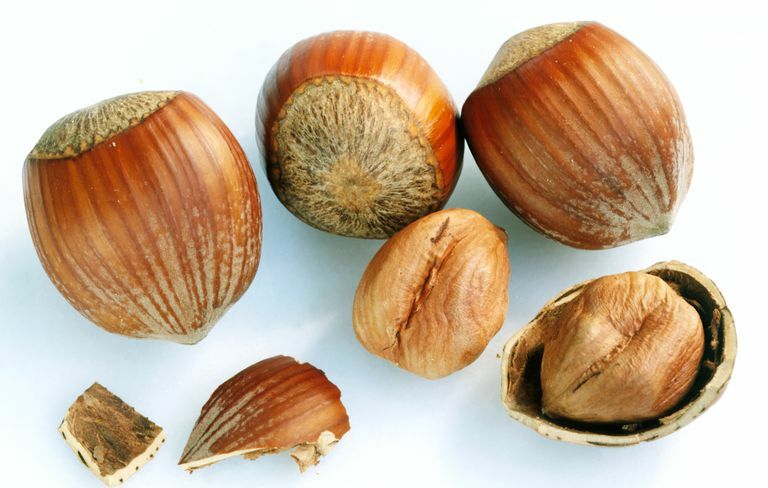 Hazelnuts, which also are called filbert nuts and cobnuts, look a bit like acorns when they're in the shell. These nuts, like other types of tree nuts, can cause food allergy symptoms that range from mild to severe. Hazelnuts can grow almost anywhere in the continental United States, but most people purchase them in stores. You'll find hazelnuts by themselves, in mixed nut snacks, and in confections such as praline. They're also used to make chocolate nut spreads such as the popular product Nutella, and to make Frangelico hazelnut liqueur. Oral allergy syndrome (OAS) is a form of food allergy in which people who are sensitive to specific types of pollen also react to certain foods that are related to those types of pollen. In the case of hazelnuts, many people with birch pollen allergies also react to hazelnuts. The pollen from birch trees and hazelnuts contain allergens that are related, and so your body reacts to both. Symptoms of hazelnut oral allergy syndrome are usually fairly mild and are confined to tingling, itching or swelling of the lips, tongue, and throat. These symptoms may be treated with an over-the-counter antihistamine such as Benadryl. After taking an antihistamine, a person with this condition should be monitored for the next few hours to make sure that more serious allergic symptoms do not develop. Occasionally, some people with oral allergy syndrome have more severe reactions that may include rashes, delayed gastrointestinal symptoms such as abdominal cramps and diarrhea, or, very rarely, the serious allergic reaction known as anaphylaxis. More severe, full-body reactions require immediate treatment with the drug epinephrine. There is no cure for hazelnut allergy. Management of your hazelnut allergy involves avoiding hazelnuts and being prepared for future reactions. Talk to your doctor or allergist if you have any symptoms after eating or touching hazelnuts. You may need allergy testing to determine the severity of your reaction and to determine if you have allergies to other nuts. Do You Need an Epinephrine Auto-Injector? Some people with oral allergy syndrome have only localized reactions that have been successfully treated with antihistamines. However, your doctor may prescribe an epinephrine auto-injector (commonly referred to by the brand name EpiPen) for you just in case of a more severe reaction. If your doctor prescribes the device, you will need to carry your auto-injector with you at all times so that it's available for you to use in the case of a severe reaction. Nuts are one of the eight most common food allergies in the United States, and so are covered by current food allergy labeling laws. Food manufacturers are required to list nuts on their ingredient labels in plain English. That makes nuts fairly easy to avoid in packaged foods. A hazelnut allergy warning on an ingredient label should look like this: "Contains Nuts (hazelnuts)." Some foods, such as those served in restaurants or at someone's home, will not come with convenient ingredient lists on them. You should learn to recognize foods that commonly contain nuts. When ordering food in a restaurant, stay safe by always asking questions of your server or asking to speak to the chef about your hazelnut allergy. American Academy of Allergy, Asthma and Immunology. "The different faces of hazelnut allergy across Europe." Published online March 14, 2015. Food Allergy Initiative. Tree Nut Allergy.